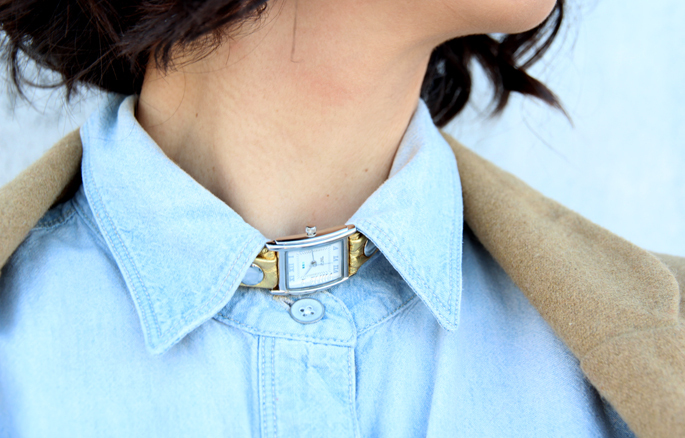 After I saw Laura of On the Rack's most recent post, I knew I had to try wearing one of my watches as a choker today. Little quirky details like that just get me every time. Love this outfit! I never thought of a chambray shirt as a pastel but it definitely works. Just curious, how did you get your watch to fit around your neck? I love this! Those cropped trousers look fabulous on you, and I love them paired with the chambray. Great bag too! Such a cool idea to wear that watch as a necklace. I got the same one at the FABB conference, and I will be borrowing this idea! I'll report back on how it goes. I know everyone has already said the same thing, but that watch is a necklace?! I'm in love! I can't wait to try! What a cool idea to wear the watch as a necklace! I imagine that would only work with longer wrap strap watches which I unfortunately do not own! Woah! What a cool idea! Loving the pastels. This is a great way to wear them with this cold weather! you look like a doll my dear. A watch necklace!? Oh my god that's genius! Although it would make it kind of difficult for you to find out what time it is lol. Looking gorgeous as always! I love the color of your pants. I love this outfit! so sweet and feminine, but with interesting touches like the b/w shoes and the watch on your collar. Those pants are the perfect shade of pink! This is really inspiring. My winter wardrobe is consistently black but this looks super fresh. Love it. Your outfits just keep getting better & better. Great inspiration to always look my best. Love the pastel pants!! Love a chambray top! so cute! Perfect look! I am so in love with your style and you´re my fashion-inspiration of the moment!!! wow i'm in looove with these trousers, the color is so pretty. Love the colors , the style ! everything ! FAB colour palette. I'm definitely going to be rocking the pastels this spring/summer. 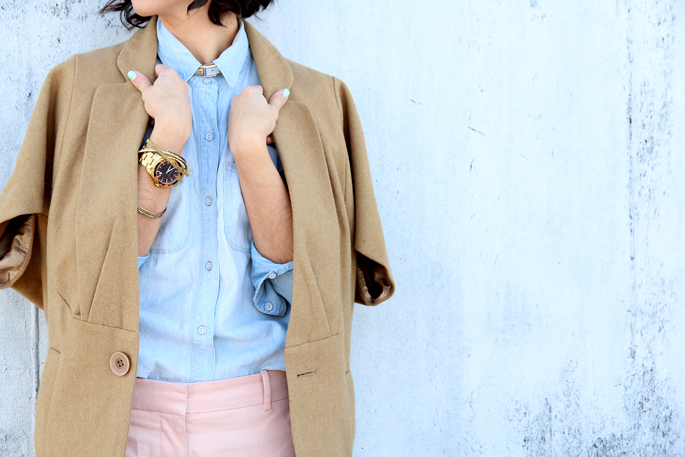 LOVE the watch as a choker :) Looking great in pastels and i'm obsessing over your bag! Oh my I love the watch as a choker, you styled it in a very classic way. You look gorgeous in this outfit. Love pastels on you. Yesss, love so much. That watch is ingenious! loved this look! amazing matching colors and cool watch/necklace ! Check out my new post on my trip to London and what I bought. I love the watch idea, so cute! All of your outfits are always lovely Ms. Krystal! I look forward to seeing what cute thing you come up with next and I am LOVING the new hair! I love your pants! Especially with the denim. love this! i'm always looking up ways to brighten up dreary winter days. totally inspiring! 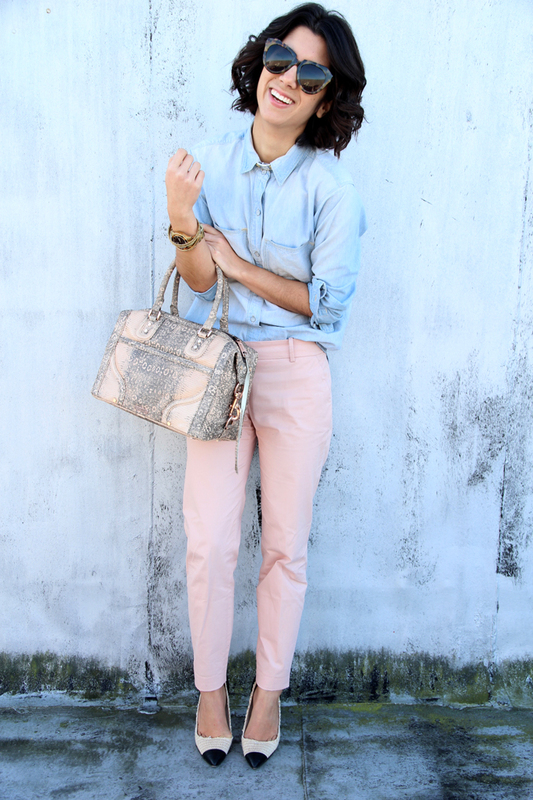 Love the pastel pant with chambray top! And the watch idea is fun too, it reminds me of a clerical collar that a priest wears. Krystal you look so put together and classy as usual! I'm drooling over that bag and the pants. Nice look. LOVE THIS! I wish I could bare ankles in the winter... sigh. Also, still wish I managed to find those shoes in my size. I get pangs of sadness anytime I see you and Blair wear them. Love the colors, but your amazing hair and the texture of the bag really seem to pull the whole look together. Great inspiration! Love all the colors here! Nails and everything! What a creative idea using the watch as a collar! I love the collar idea. I Love the watch collar idea! So creative and chic! Love the pastels! You look as pretty as a confection! Such an amazing outfit, I love the idea of a watch as a necklace! Loving the watch as a necklace! Definitely gonna have to try that with my own La Mer! haha the watch bit is amazing. Not too quirky so I love it. Love all the soft colors! love love love this. love love love pastels. Even better? These winter pastels. The watch/choker detail is SO adorable! Great idea for winter and spring!